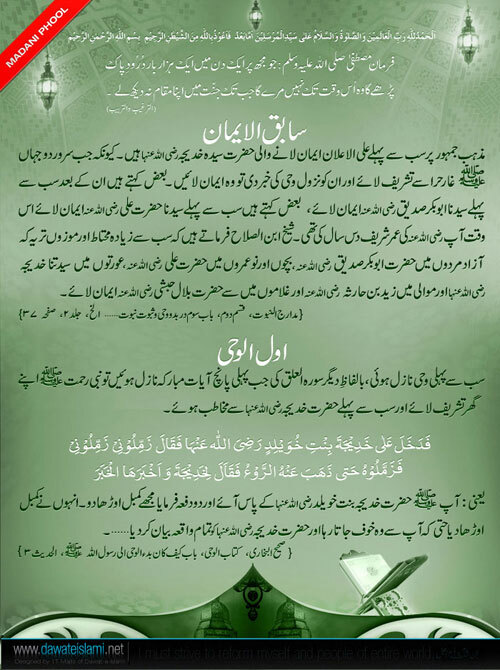 Hazrat Khadija (رَضِیَ اللہُ تَعَالٰی عَنْھا) is an excellent ideal guide for all the Female Muslims all over the globe. The sacrifices made by her and her inputs for preaching Islam are countless. Her well-known title was “Malikat-ul-Arab”. Hazrat Khadija (رَضِیَ اللہُ تَعَالٰی عَنْھا) had a rooted devotion to the religion of Islam, also devotion and acceptance towards Almighty Allah. She donated all her riches for Islam and settled by the side of her husband, the Prophet of Islam (صَلَّی اللہُ تَعَالٰی عَلَیْہِ وَاٰلِہٖ وَسَلَّمَ). The tremendous honor for Hazrat Khadija (رَضِیَ اللہُ تَعَالٰی عَنْھا) is that Almighty Allah (عَزَّوَجَلَّ) accepted her strives and revealed the following Verses of the holy Quran: “And when we found you in need, we made you needless” – Surah 93 (Zuha): Verse 8. After her father’s death Hazrat Khadija (رَضِیَ اللہُ تَعَالٰی عَنْھا) administrated the ancestry trade, and as an outcome, it swiftly enlarged. With the income Hazrat Khadija (رَضِیَ اللہُ تَعَالٰی عَنْھا) aided the needy, widows, orphans, the ill and the handicapped. If there were any needy girls, Hazrat Khadija (رَضِیَ اللہُ تَعَالٰی عَنْھا) wedded them, and provided them with dowry. Some tribe representatives functioned as Hazrat Khadija’s (رَضِیَ اللہُ تَعَالٰی عَنْھا) advisory Councils on trade’s essential features but she depended on her personal wisdom, yet she still greeted their opinions and studied it. Mostly vendors having merchandise to trade as Hazrat Khadija (رَضِیَ اللہُ تَعَالٰی عَنْھا) didn’t have any curiosity in crusading with their convoys. So handlers were usually preferred for the errands that were usually well reputed for business sense. Hazrat Khadija (رَضِیَ اللہُ تَعَالٰی عَنْھا) would contract an agent whenever her merchandise was loaded and ready to sail away. By carefully appointing wise handlers, and purchasing and auctioning at the appropriate moment and at the suitable point, Hazrat Khadija (رَضِیَ اللہُ تَعَالٰی عَنْھا) made unbelievable incomes, which transformed her into the wealthiest exporter in Mecca. Whenever convoys of the Macca traders set out on their quests, the merchandise of Hazrat Khadija (رَضِیَ اللہُ تَعَالٰی عَنْھا) alone was if compared equal to the merchandise of all the other traders of the “Quraiesh” if compiled together. The locals of Mecca called Hazrat Khadija (رَضِیَ اللہُ تَعَالٰی عَنْھا) as the “Empress” of “Quraiesh” because she exhibited the traditional “fortune touch,” which hinted that whatever she touched virtually converted into fortune. It was when she had sent the holy Prophet (صَلَّی اللہُ تَعَالٰی عَلَیْہِ وَاٰلِہٖ وَسَلَّمَ) as her delegate to trade her goods along with her loyal slave and he returned with exceptional details of not only the holy Prophet’s (صَلَّی اللہُ تَعَالٰی عَلَیْہِ وَاٰلِہٖ وَسَلَّمَ) abilities in dealing but also his unprecedented personality that Hazrat Khadija (رَضِیَ اللہُ تَعَالٰی عَنْھا) anticipated of sharing her life, soul and belongings with him. In the meantime, the loyal slave informed Hazrat Khadija (رَضِیَ اللہُ تَعَالٰی عَنْھا) about the strange events that occurred and among these was the unbelievable view of witnessing “Archangels” overshadowing Muhammad (صَلَّی اللہُ تَعَالٰی عَلَیْہِ وَاٰلِہٖ وَسَلَّمَ) from the penetrating sun. When Hazrat Khadija (رَضِیَ اللہُ تَعَالٰی عَنْھا), wedded the Holy Prophet the groom was approximately 25 years old, the bride, 40 years old but the contrast was perfectly invisible as the groom was the most handsome and noble among all men, the bride was the most gorgeous and charming among all women. The groom was the most courageous, faithful, the trustworthy, the decisive and the sincere male of Makkah as for the bride was called “Tahirah”, the purest one, and the “Empress” of “Quraiesh” and Makkah. It was an incomparable match that demonstrated to be the most sanctified wedlock on earth. The bridegroom was Muhammad bin Abdullah (صَلَّی اللہُ تَعَالٰی عَلَیْہِ وَاٰلِہٖ وَسَلَّمَ) and the bride, Hazrat Khadija bint-e- Khuwaylad (رَضِیَ اللہُ تَعَالٰی عَنْھا). She was from the same Banu Hashim family of the Banu Asad clique from which our Holy Prophet (صَلَّی اللہُ تَعَالٰی عَلَیْہِ وَاٰلِہٖ وَسَلَّمَ) existed. When Islam was under immense pressure from its adversaries, Hazrat Khadija (رَضِیَ اللہُ تَعَالٰی عَنْھا) deserted her luxuries, her riches and her homeland and even devoted her life in the prosperous way of Islam. She elected to posture beside her husband and his clique, and to share the catastrophe of life with them. She had to face not only the discomfort of starvation and craving but also the limit of hot weather in riot time and freezing weather in winter tides; yet she never grumbled about them. Whether occasions were acceptable or unacceptable, she had little or much, she was always happy. Harshness and difficulties never unsettled her. It was this attitude which was an unending means of satisfaction, determination and stability for her husband all along the ebony and arduous stage of his life. After the announcement, she was the first to welcome Islam and Muhammad (صَلَّی اللہُ تَعَالٰی عَلَیْہِ وَاٰلِہٖ وَسَلَّمَ) as the holy prophet of Almighty Allah (عَزَّوَجَلَّ). The honor and importance of being the first woman devote in the entire world, is hers forever. She backed him with all she had, perception, happiness, and riches, when all tribes of Makkah became his opponent and victimized him repeatedly. Hazrat Khadija (رَضِیَ اللہُ تَعَالٰی عَنْھا) was the well-off entrepreneur of the complete Arab territory and after the announcement of Islam by the holy Prophet (صَلَّی اللہُ تَعَالٰی عَلَیْہِ وَاٰلِہٖ وَسَلَّمَ) she donated all her riches for the benefit of Islam. A cloak of the holy Prophet was used as a shroud for her, and she was given a burial in it. The holy Prophet (صَلَّی اللہُ تَعَالٰی عَلَیْہِ وَاٰلِہٖ وَسَلَّمَ) forever recalled Hazrat Khadija (رَضِیَ اللہُ تَعَالٰی عَنْھا) with tenderness, strong fondness and appreciation. Her death grasped his heart with much agony and pain. Hazrat Khadija (رَضِیَ اللہُ تَعَالٰی عَنْھا) passed away on the 10 Ramadan of the 10th year of the announcement of Islam in 619, and she was laid to rest by the holy Messenger of Almighty Allah (عَزَّوَجَلَّ), he himself went down into her grave to lay in it for a few minutes. He (صَلَّی اللہُ تَعَالٰی عَلَیْہِ وَاٰلِہٖ وَسَلَّمَ) leveled the earth on her grave after the burial. He loved Hazrat Khadija (رَضِیَ اللہُ تَعَالٰی عَنْھا) so dearly that after she passed away he used to often remember her. Hazrat Khadija’s (رَضِیَ اللہُ تَعَالٰی عَنْھا) prestige was such that the Angel Jibraeel (عَلَیْہِ السَّلَام) used to bring greetings (سَّلام) for her from Almighty Allah (عَزَّوَجَلَّ).